We love wild Alaskan salmon because it’s one of the best sources of beneficial omega-3 fatty acids and vitamin D. Plus it’s fished in a sustainable manner. You can make this with or without a wood plank and it’s as good on the grill as it is in the oven. Soak wood plank in water 30 minutes to 2 hours. Pat wood plank with paper towels and spray-coat or lightly oil one side. Place green onions on plank; top with Alaska Salmon. Blend remaining ingredients; rub 1/2 to 1 teaspoon on each salmon portion or all onto salmon side. Let the salmon rest 5 minutes before cooking. Heat grill to medium-high heat. 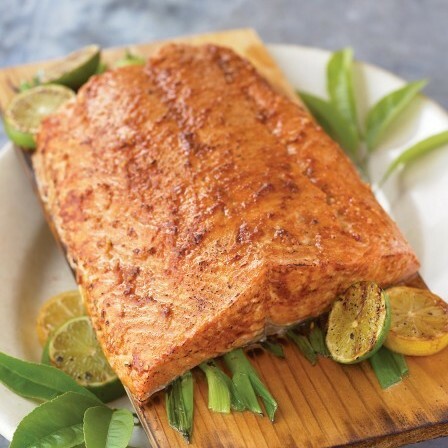 Place the planked salmon on the grill using indirect heat (not directly over heat). Reduce heat to medium and cook in covered grill for 10 to 15 minutes. Cook just until salmon is opaque throughout. *Add 1/4 teaspoon crushed red pepper flakes for additional heat, if desired. Chef’s Tip: This recipe works great whether you use a plank or cook straight on the grill. Or, bake at 400°F (6 to 7 inches from heat source) for 10 to 15 minutes.